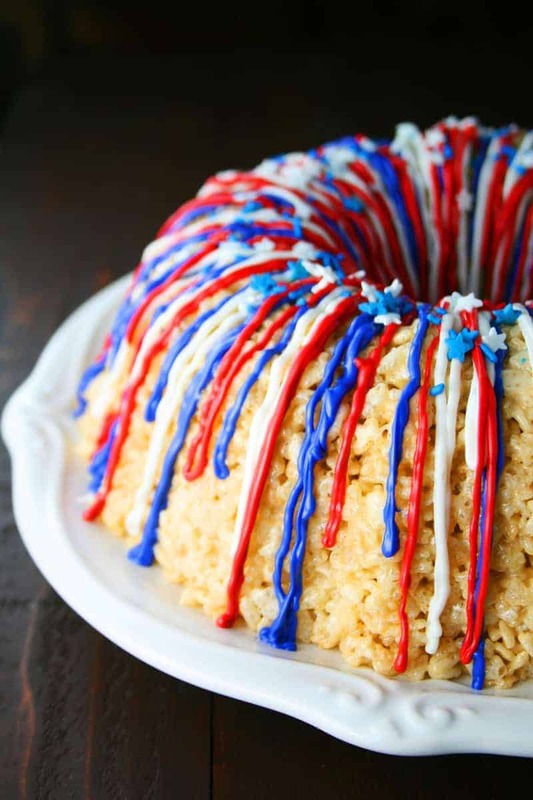 Rice Krispies Treats are pressed into a Bundt cake pan to form this Patriotic Rice Krispies Cake with red, white and blue candy melts drizzled on top. Hey everybody and Happy Memorial Day! 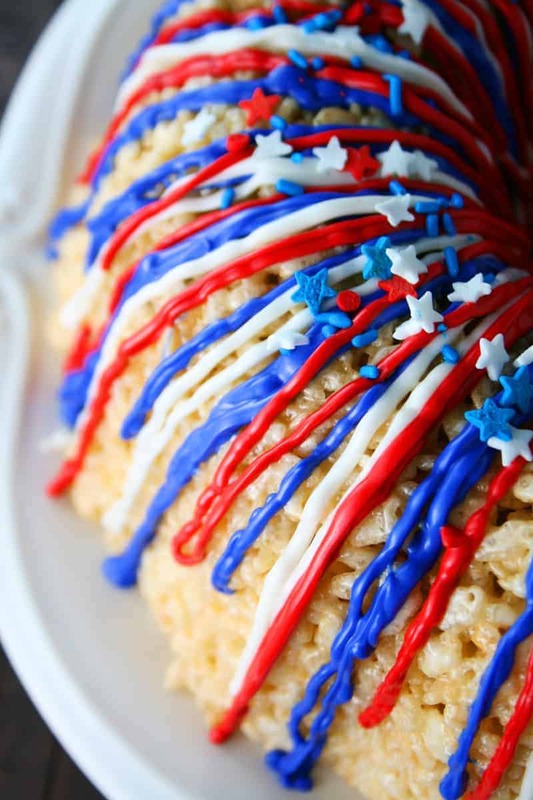 I just wanted to do a quick post today to share this awesome Patriotic Rice Krispies Cake with y’all. I brought it to a pool party yesterday and the kids really loved it! I shared a similar cake for Valentine’s Day cake in February. It was a Strawberry Rice Krispies Cake, so I used the same method to make this cake except I left out the strawberry Jello and changed the candy melt colors on top. 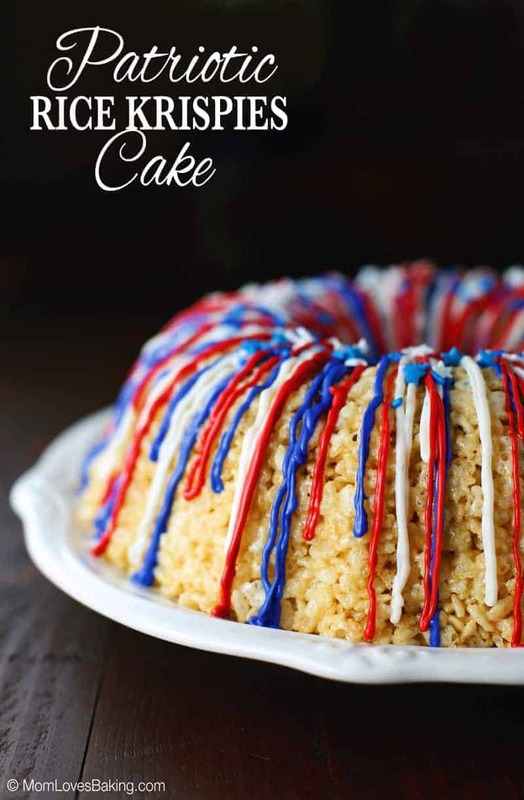 This is such a fun cake for a party and you can change it to fit any holiday. 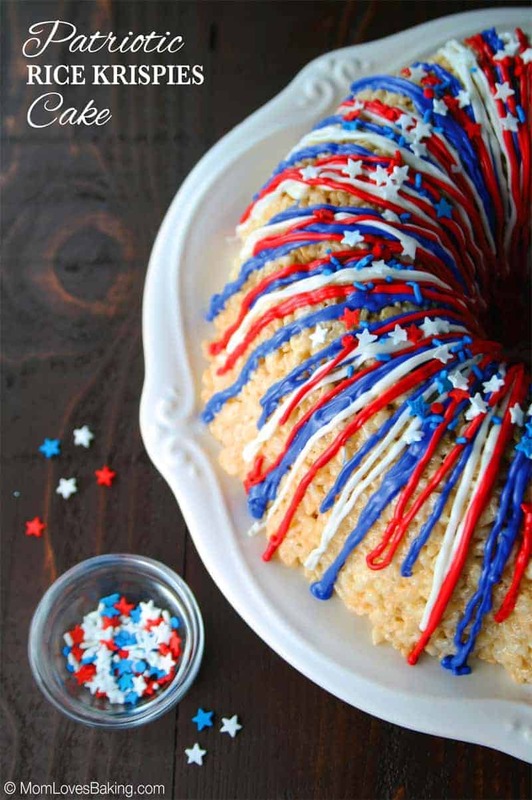 It’s simply a double recipe of Rice Krispie Treats poured into a greased Bundt pan. Then you press it down really well and let it cool completely. When you invert the pan, you get a perfectly shaped Bundt cake. Then you melt colored candy melts and use a piping bag to drizzle it over the cake. 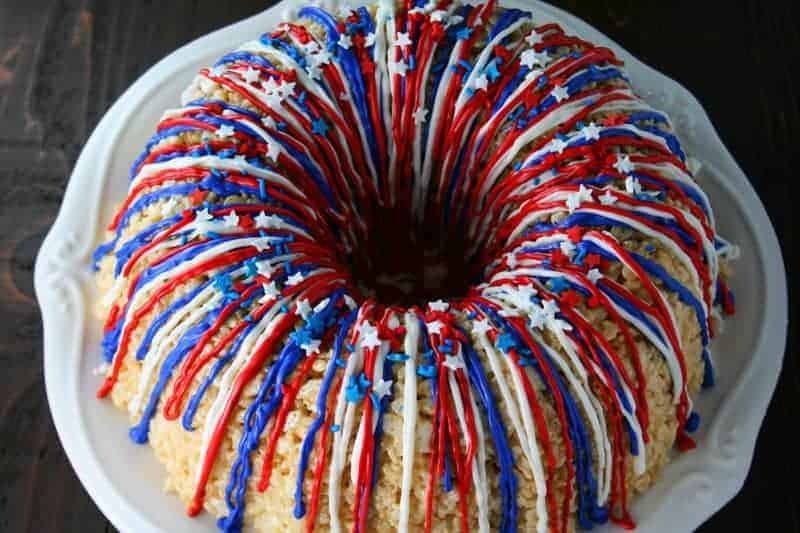 And lastly, you add your patriotic sprinkles to make it look even more all American. Let the drizzled candy melts cool and set before slicing into this baby. You can stick it in the refrigerator to speed up the process, if needed. Cutting this cake is easy. 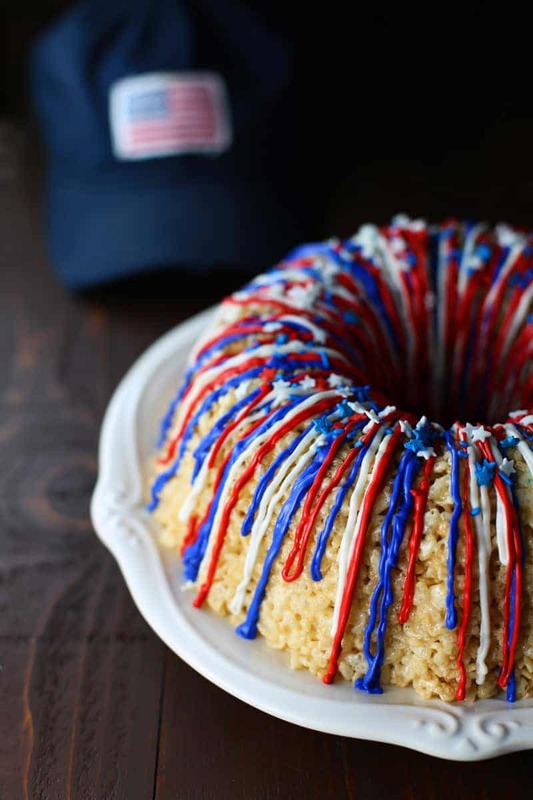 Just cut into it with a sharp knife as if you were cutting a regular Bundt cake which will give you a perfect portion of what is basically a dressed up Rice Krispies Treat. Did I mention that it’s really tasty too! 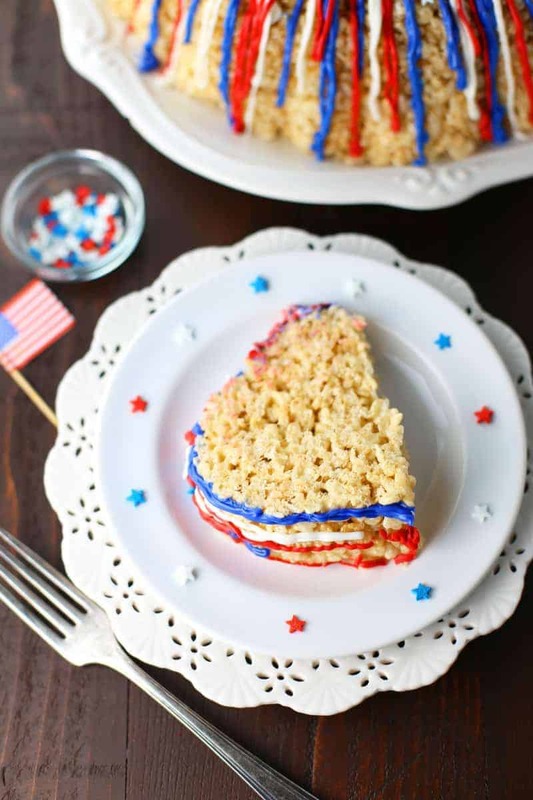 If you’re a fan of Rice Krispie Treats, then you will most definitely love this Patritotic Rice Krispies Cake! It’s a great dessert for all ages, but especially the kiddos. Let us remember those that have served our country and are serving now. We are forever grateful. May God bless them all and may God Bless America! Click here for the Strawberry Rice Krispies Cake recipe with step-by-step photo instructions. 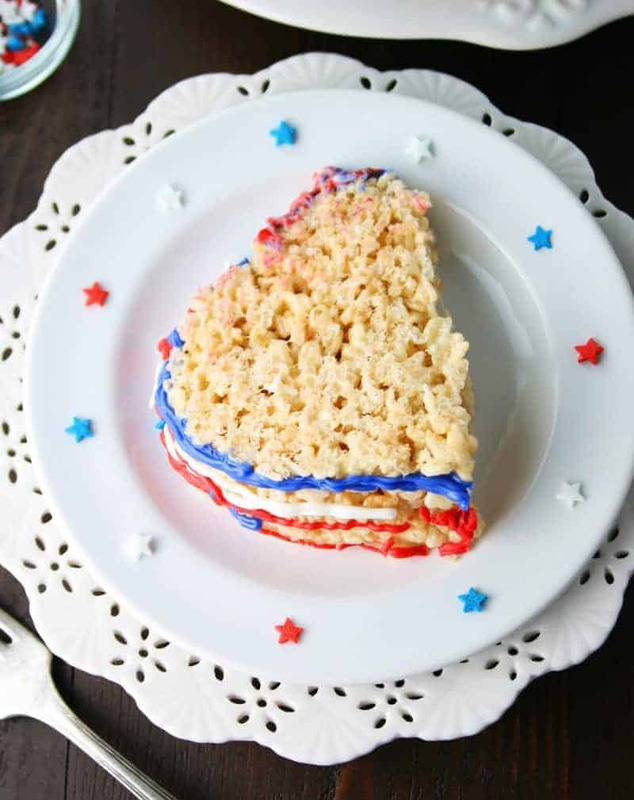 Simply omit the strawberry gelatin and use red, white and blue candy melts for the topping.